The Internet didn’t kill TV! It has become its best friend. Americans are watching more television than ever before, and we’re engaging online at the same time we’re tuning in. Social media has created a new and powerful “backchannel”, fueling the renaissance of live broadcasts. Mobile and tablet devices allow us to watch and experience television whenever and wherever we want. And “connected TVs” blend web and television content into a unified big screen experience bringing us back into our living rooms. 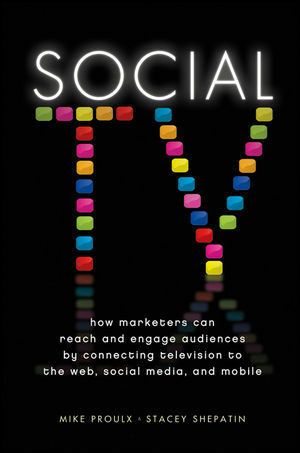 Social TV examines the changing (and complex) television landscape and helps brands navigate its many emerging and exciting marketing and advertising opportunities. The rise of one technology doesn’t always mean the end of another. Discover how this convergence has created new marketing opportunities for your brand. MIKE PROULX is a Senior Vice President and the Director of Social Media at Hill Holliday, leading a team with a focus on cross-channel integration and emerging media. He has spoken at dozens of events and contributed to a number of publications including BusinessWeek. He conceived, produced, directed, and cohosted the TVnext Summit, which took place in early 2011 and 2012. You can follow Mike on Twitter at @McProulx. STACEY SHEPATIN is a Senior Vice President at Hill Holliday and leads the national broadcast buying and strategic media partnerships practice for the agency's portfolio of clients, including Dunkin' Donuts, Chili's, (RED), T.J.Maxx, Marshalls, Liberty Mutual, John Hancock, and HomeGoods. She has won multiple awards for her work and creativity, including the Advertising Age Media Maven award and MediaWeek's Media Plan of the Year.